Perhaps you had cancer at an early age, or your child had a cancer at an early age and while talking to an oncologist you start going over your family history of cancer. After the oncologist flips over your chart to get more room for your history of cancer- a light clicks on. There’s something more to this. 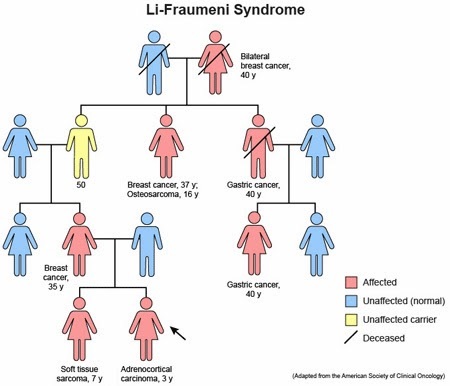 The next thing you know, you have a referral to a geneticist or a genetic counselor and they mention hereditary cancer, the possibility of Li Fraumeni Syndrome. Perhaps you are a young mother who finds she has breast cancer. The BRCA test comes back negative yet your gut and your doctor’s gut both say- young women shouldn’t get cancer this early. Perhaps you are a young man who is on his 3rd cancer and wondering why this keeps happening. Perhaps you have watched your spouse’s family fight cancer over generations and heard stories of their cancer curse. You turn to the internet and stumble on something called Li Fraumeni Syndrome. The doctors in your town have never heard of it and tell you it’s not likely your children have hereditary cancer. You know there was a reason behind this, now what? This is not about who should get tested for LFS- that information can be found in dozens of online articles, wikipedia, or any search for Li Fraumeni Syndrome. This is about the actual genetic test and how it will impact you and your family. Getting tested for any genetic condition is a VERY PERSONAL decision. You have to be informed and ready to do the test. Make time to gather the information you need to make your decision easier. Genetic Counselors are trained to help patients do this. A physician can refer you to a genetic counselor or you can see if there is one in your area at the National Society of Genetic Counselors, nsgc.org A trusted doctor can also give insight into the medical pros and cons of being tested. There are many unknowns and many emotions when dealing with Genetic testing. When you have to make a tough decision, it’s helpful to talk to others who have been through it. These are fellow LFSers experiences through testing themselves and their children. – Will the test change your/your child’s future? -Is the test result needed for peace of mind? -Is the test needed to obtain screening? -Will the test result affect job/insurance/health care? -Can the screening/treatment/precautions be achieved without the test? Will the test change your future? Absolutely. Positive or Negative, learning the results will change how you approach life and screening. Finding out the results will be emotional- whatever they are. Be prepared for the mix of emotions that the results will bring and know that others have been through it too. When my results came back “inconclusive” for the breast cancer genes, my genetic counselor recommended proceeding with the test for LFS. It took a few weeks to decide to do the test, as I was extremely emotional about the implications of future cancer but also for my daughter’s future. I decided to get tested so that I could benefit from screening and also to make some sense of my sister’s death. Given the fact that my sister and I were both diagnosed with cancer in our early 30s, I was not surprised when my test came back positive. BUT at the same time it was a huge let down. I was finishing up with chemo and about to have my mastectomy and was just ready to move on and get away from cancer. Instead, LFS became the top worry in my life. I’ve been “unaffected” thus far so I can’t say that I understand every aspect of LFS. I have always expected doctors to treat me like I’m crazy, so I’m not surprised when they do. On the other hand, it’s been more difficult for me to deal with family, friends, and co-workers who call me a hypochondriac and have said things like “there is no way LFS is a real thing,” and have been, not just misunderstanding, but really mean and cruel about someone my age going to see so many doctors and having so many tests – like I enjoy it or like the attention. Yay! I want to get every lump removed, because it’s so fun, and cheap! Yippee, another MRI! I love waiting an hour to get a test done and filling out the same forms for the 10th time and $100 co-pays and missing work or fun activities. Don’t get me wrong, I’m very lucky and could have it much worse…I’m not complaining. I just don’t enjoy this stuff and it really hurts when people around me think I do. I originally did not get testing because I did not want to live in fear. I knew since I was little that I wanted to have kids. I knew that it was going to be a challenge due to circumstances that didn’t have to do with cancer and I didn’t want to put another issue on the list. I grew up being surrounded by cancer, but I guess in some ways lived in denial. I also didn’t get tested because of fear of how it would effect life insurance. Now that I’ve had cancer, things change. How will my family react? How others react to your being tested and your test results is not always what you expect. The implications of a genetic test are huge, but it is important to remember we are not to blame for genes. Our parents are not to blame. Hopefully one day we will know why this mutation occurs and have prevention. For now, blame only serves to hurt relationships. My diagnosis 2 years ago changed some of my priorities in life, who would have thought? Problem is my family don’t get it, & should i ever mention anything to do with being prepared and trying to live to the max now, i get accused of all sorts of things. They just don’t want to know. I understand how devastated we all are about losing my mother several years ago, but i feel that I lost my whole family support network that day too. She was in her 30s when she developed her 1st primary, as i am now. To date i have been incredibly fortunate not to have had any cancers diagnosed myself, though i have lost a grandfather, an uncle, 2 aunts and a cousin to lfs. I just want to make the most of life, and my family just bring me down, the thing is i don’t want to completely cut them off, but i need to find some kind of balance. This is one of the hardest issues a family can face. It is so terribly personal. As more research has been done and is being done it has become easier for a parent to decide to test or not to test. There is so much more information now. Families still have very different opinions and some who have had the testing and know the results may be faced with family members who don’t want to be tested–don’t want to know results if tested and can’t discuss anything about LFS, LFS testing, or how to deal with it. They sometimes distance themselves from those who test positive. They sometimes distance themselves from talking about it or from supporting someone in the family who has tested positive or has cancer. In my own experience I can say I have experienced all of the above issues. The best I can recommend is to do your research. Be aware if you have children and choose to have them tested that you are responsible for helping your child deal with the aftermath and the future follow up that will be needed. You must be prepared to be the only support that they may have. It is a lucky family who can discuss this among themselves and then choose to support everyone whether they are positive or negative since each test result poses its’ own set of difficulties. We were blessed with relative simplicity in testing, because there were no other implications up our family tree. It only affected our children…and we have had support that is not complicated by foisting such information on someone whose status is implied from such testing. LFS, as we have discussed, weaves its way into most everything…no subject is safe. It would be very hard to have relationships that had a mute on our mutant status…it affects everything. I have family members who don’t want to be tested or were tested and don’t even want to know the results. I respect that. I didn’t want to be tested for a time. My being tested impacts all of them because of the possibility. They have to be comfortable with the decision for themselves. Despite this, my family supports me and helps me through the challenges. You don’t have to know the results to know you are family. Some families disagree over jobs or life choices, we are a family affected by hereditary cancer. We have to work through this like any other issue. What about Testing Children? Testing children for hereditary cancer can be pretty controversial. It can also be a means to early detection and increased survival. The decision is difficult. Ultimately you have to decide what is right for your family and how you approach living with LFS. These are people’s thoughts. Listed under resources are some more links to sites and articles that give insight into how to make the decision that’s right for you. Before my husband passed away in 2009 he was totally against having our 4 children tested. Nothing I said made him change his mind. After he passed it was a thought in my head at all times. I never acted on having them tested until my then 12 year old said she wanted to get tested. I had her tested and within a year had the other 3 tested. I was in complete shock when 3 of the 4 came back positive, and after the initial shock I was so glad I tested them. My kids are 16, 12, 10 and 8. The 10 yr old is the only one without lfs and that is hard for her at times. She feels guilty and worries horribly about her sisters and brother. They are all very healthy kids and for that I am so thankful. Wouldn’t dream of not testing, personally. No regrets about that at all, except that 2 kids are positive. That was unchangeable, but knowing has been empowering without question. My siblings and I weren’t given the benefit of being asked if we wanted to know. My father decided on being tested 12 years ago and the results came back after his death. Given my sibling’s and my history we knew we were positive too. I only found out fairly recently that my oldest sibling never wanted to know the results, but was never given the option of hearing the results. Testing is a really sticky wicket. We didnt know about lfs until after my husband passed at 25 with liposarcoma and my youngest with glioblastoma, and then my older daughter got cancer they told us of lfs. Her daughter was tested at 13 and is positive. Her siblings aged 8 and 9 will be tested at NIH in the next few months to see if they have it as well. Early detection is the best chance for survival I see it as a responsibility. And if we have one that is negative that will be wonderful, as we look at it now as they might all have it. Personally to me it is the only choice as they can get cancer so young. I have decided that they need to be tested before age 5 so they grow up with it or choose it for themselves when they reach 18. I want doctors to take us seriously and if I can help it I would prefer to minimize unnecessary screening for any without LFS. At first, my husband and I decided that we would wait to test the girls. We felt that they deserved a normal life and it wouldn’t be possible to do that if they were constantly at the doctor for screening. We also were concerned that psychologically, it would harm them as they got older and keep them from all the normal things like dating and starting a family. It was fear that was holding us back from the testing. That year we were trying to decide was full of worry each time they became sick with colds, strep throat etc. We worried about the smallest things being cancer. So, I continued to do my own research about LFS and got advice from others and we finally decided to test them. Both of my daughters are positive and I am so glad that we did test them. Screening them is the best thing we can do for their future. We have had 2 appointments over the past 6 months for their screening and although the day at the hospital is stressful, they are resilient and just as happy as they always are. We still worry about the little things with them but it gives piece of mind to have recent negative screenings and a doctor that we can talk to immediately if something were to come up. I also think is not easy to make the choice of your children being tested because you’re so afraid of positive results but I agree with everyone that knowledge IS power and gives you the advantage of early detection, I was the first of 5 siblings to be tested came back positive then they got tested and 3 were positive, one negative, on my brother they found encapsulated lung cancer, they just did resection and didn’t even need other treatments, up to now my only son had been tested and came back negative but there are 7 more children to be tested, some want to do it and others are not ready they’re teenagers. I realize now that I carry a gene that could effect my kids. It is scary and I’m still not 100% sure if I want to get them tested yet. Do I want them to have the choice. I mean, really, if we know I am positive. I tell their docs that and get them in with the right docs to keep an eye out, do I need to make that decision for them. Maybe they don’t want to live in fear either. I will say, I fully plan on looking into getting them tested and the pros and cons and talking to good genetic counselors to hear their thoughts. What are the benefits of being positive? Hands down, the biggest reason given for testing is to get better screening with the hope that early detection saves lives and increases survival. I believe testing is the way to go I found out that I carry the gene in 2000 and I had my two kids tested shortly after finding both of them have it. I think knowledge is power we have been doing regular scans since then we have had a few scares and on my daughter we have been watching a spot for 3 yrs in nov 2013 through a regular check up they found another spot and because of the knowledge that she was a carrier we cought it early on and small it is cancer but because of early detection they haven’t done any chemo or radiation. Her scans now are every three months but she was back to playing competitive softball 3 weeks after surgery. If we didnt know that she carried the gene and had her scans done regularly I could be telling a very diffrent out come to my story, my story may not be over but her life is better because of early detection. We didn’t know about lfs until after my husband passed at 25 with liposarcoma and my youngest with glioblastoma, and then my older daughter got cancer they told us of lfs. Her daughter was tested at 13 and is positive. Her siblings aged 8 and 9 will be tested at NIH in the next few months to see if they have it as well. Early detection is the best chance for survival I see it as a responsibility. And if we have one that is negative that will be wonderful, as we look at it now as they might all have it. Personally to me it is the only choice as they can get cancer so young. Quotes solicited from members of the Facebook LFS Support Group when asked about genetic testing for LFS.